I saw a minibus yesterday with the name “fsmschool.com” on it. 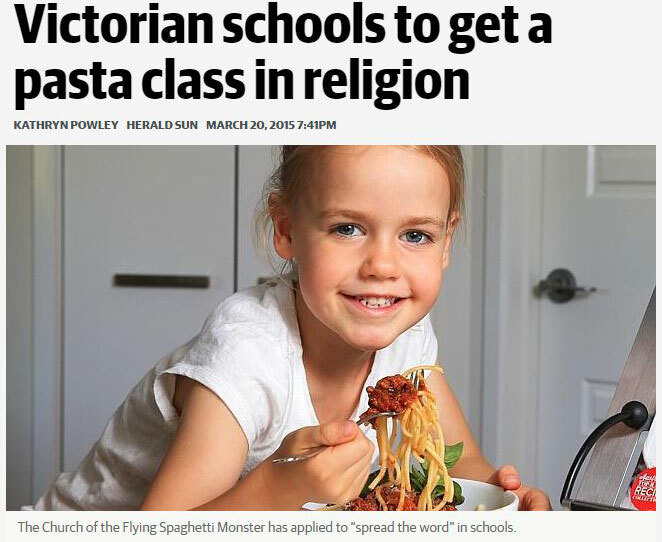 I thought somebody had started a school based on the worship of our noodly deity, but it transpires that “FSM” stands for something completely different (find it via Google). Maybe somebody should start an FSM school. We couldn’t regard it as successful unless every student who graduates from the school is convinced that neither the FSM or any other deity exists. Kind of defeats the object. Why should you worry about the beer volcano when other “christian”, jewish, and muslim teachers have probably mentioned “hell” , a sadistic belief about a place of eternal torture? Dear Maxx, I’m intrigued by your post but can’t figure out to which and to whose previous post you are responding to with your remark. It’s obvious the internet has actually emerged as a viable conduit for commerce and details. Job seekers have wholeheartedly accepted the net as an essential component of any sort of job search. The internet has some inherent advantages for publishing works; i.e. everything is digital, it requires no documents, minimal document maintaining and also in many cases could be instantaneous in terms of creating visibility for your job uploading – most significantly, it’s very easy to make use of and leverage. … and it’s a good place to buy sack curtains.